We offer excellent quality of Marble Kali Mata Statue which is crafted from top notch quality marbles to ensure that the statues last long. The ecstatic workmanship reflects the creativity of our craftsmen and their quest for achieving artistic perfection. Understanding the differences in client demands, we undertake tailor made solutions to craft the statues as per client needs. We feel proud to introduce ourselves as a trusted name, offering unrivaled quality range of Marble Kali Mata Statue. Offered statue is extensively acclaimed and appreciated for its excellent finish and lively appearance. This statue represents the beautiful craftsmanship and is designed from premium material and latest technology. Additionally, provided statue is made available in varied sizes and at affordable prices. 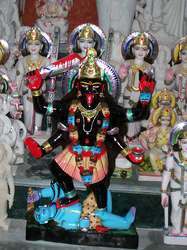 Looking for Marble Kali Mata Statue ?